I have been meaning to get this post up for a while and now Christmas is just around the corner. The last couple of years as it gets close to Christmas and I am thinking about the gifts I want to get for my kids I have felt like it was really important to find some gifts that did 2 things, first, did not use technology. I don' t have a problem with technology in general and I think that there are some great things that use it and even fit my second requirement, however my kids can be a little addicted and if I let them they will sit and play video games or watch YouTube videos of other kids playing video games (something that I do not understand at all) for hours. I feel like for my family it is important to find ways to unplug. Second, I feel like it is really important for me to find gifts that encourage creativity in my kids. 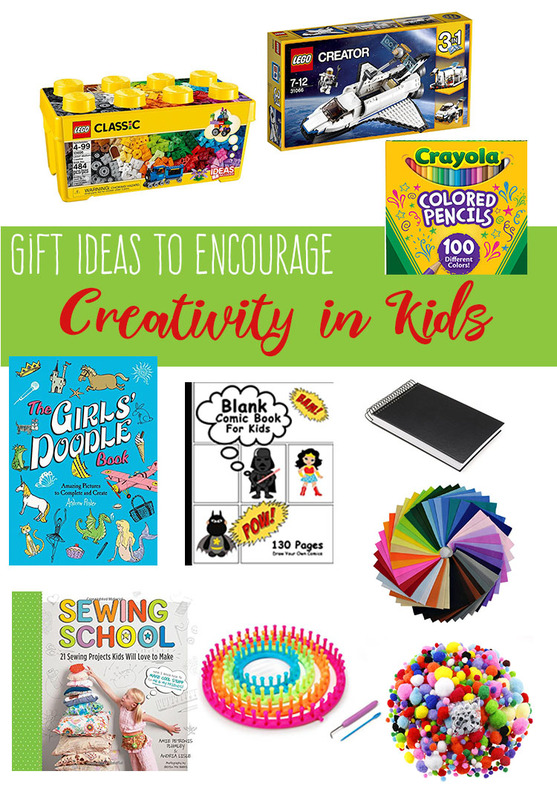 Whether that be toys, games, books, or art and craft supplies I feel like it is really important to encourage kids to be creative. I thought I would compile a list of gift ideas that I think fill both requirements. When I was thinking about toys that fit in this category the first thing that came to mind was LEGO sets. Some of my earliest memories of creating things revolve around the trunk full of LEGO bricks that we had in our family. I remember spending hours building with them. There were a lot of square houses and pyramids but we made lots of other things too. I feel like that was one way as a kid that I found my love of creating. When my kids want LEGO sets they usually ask for a specific charater themed set, Star Wars is always popular in our family and Ninjago is a current favorite. Because of the way I remember playing with LEGO when I was a kid I think the classic sets are great. The mini boxes make great stocking stuffers. 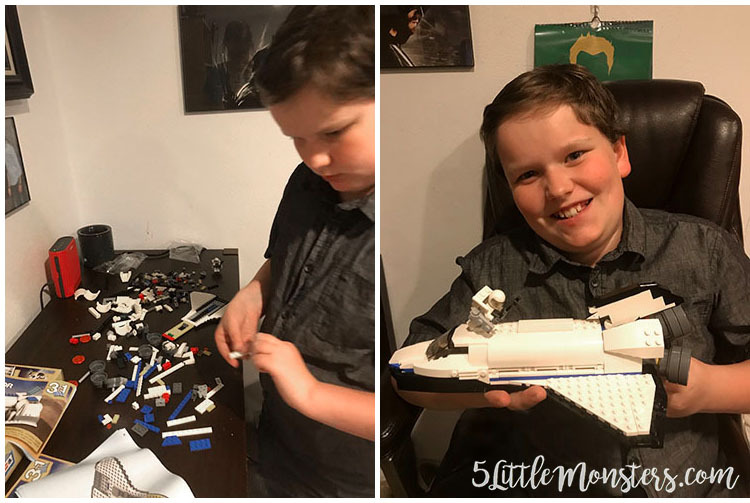 If you want something in between something like this LEGO Creator 3 in 1 Space Shuttle Set is awesome because it comes with instructions to build 3 different things with the same set. Besides, what kid doesn't love getting LEGO sets for Christmas. Last year a couple of our kids were really into drawing so we got them some drawing supplies. A blank sketchbook is always a good place to start. I like the smaller spiral bound versions for portability but the larger ones are great for drawing at home. I love colored pencils for drawing and coloring and a big box full of colors makes a perfect gift. How to Draw... books are always a lot of fun. My son loved this dragon book. Doodle books are also really fun, they have unfinshed pictures for kids to finish or idea starters for new ones. My kids love graphic novels so another fun thing that we have gotten in the past are blank comic books. Kids can write and draw their own story. This is an area that I love so I want to share it with my kids too. I have a lot of different ideas of things that would fit in this category, but for the purposes of this post I have just picked a few things. One fun thing is to get a bunch of art and craft supplies that kids can use. You can buy a premade kit like this one, or you can put together a kit on your own (even pulling from your own supplies) including things like felt, paper, chenille stems, pom poms, googly eyes, glue or a low temp glue gun for older kids, buttons, scissors, beads, and whatever else you can think of. If your kids show interest in yarn crafts one of the easiest ways for them to get started is with looms. Pom Poms are also fun for kids to make. There are also lots of kits to teach kids to knit or crochet or even finger crochet. There are lots of easy sewing projects that kids can make either with or without a machine. A book full of fun projects with supplies to make one or two of the projects would be a fun gift. These are just a few things that I thought of. What are your favorite toys or gifts to encourage kids to be creative?